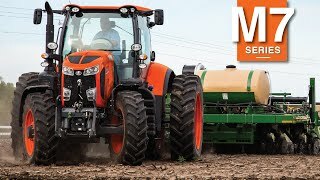 Kubota M7 Series - Model Landing - Camrose Dynamic Sales & Service Inc.
First, we imagined how a tractor might make every day farming tasks easier and more efficient. Then we stopped imagining and started building. Introducing our heaviest, most powerful tractor ever: The Kubota M7. We set the bar for engine design. Everyone is always talking about 'improved fuel efficiency'. And that makes sense. Better fuel efficiency means fewer emissions and less money spent on fuel. But at Kubota, our engineers do a lot more than talk. For our new M7, they built the turbocharged V6108 engine that combines Kubota's DPF (Diesel Particulate Filter) with SCR (Selective Catalytic Reduction) technologies so it meets even the strictest Tier4 Final regulations. All of the technology to get the job done faster. Streamline your work with the latest technology. All of the M7's functions are conveniently displayed on a single large LCD touch screen and can be adjusted and set with a simple touch. When you're in the fields from dawn to dusk, you need a ride that keeps you comfortable and working efficiently until the job is done. The M7's wide cabin is designed to do just that. With just four corner posts and no centre pillars to get in the way, the view out the front, rear, and both sides is virtually unobstructed. The cabin design also reduces noise from the outside to a minimum, so you can work in peace all day long. The M7 cabin is available with your choice of suspension systems: pneumatic, mechanical (spring), or rubber iso mount. Cabin suspension helps take the bumps out of the ride to keep you comfortable and efficient.